We offer many styles of Medieval Belts! From Sword belts to Ring Belts and More! Here we offer many different styles of medieval belts! Whether you are looking for a sword belt or a Medieval Ring Belt. This is the place to get it! We have leather baldrics, sword belts, rapier carriers, decorative medieval style belts, ring belts, buckle belts and roman belts. Our leather baldrics are designed to carry your large sword on your back. Ring belts come in a variety of styles and colors, and go great with that medieval costume. Our decorative belts are handcrafted of fine quality leather. Leather sword belts are designed to carry a sword on your left or right side. Our rapier belts are great for carrying your favorite rapier during fencing practice or re-enactment. Our roman belts are very authentic looking for that re-enactment or theater production to give you that roman soldier look. In Basic Belts you will find plain belts, adorned belts, ring belts, buckle belts, leather belts, and long belts for adults and children. In Belt Accessories you will find pewter belt buckles, belt quivers, baldric buckles. Our Ladies belts are as varied as our ladies. 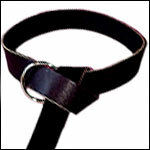 We offer coin belts, waist cinchers, wide belts, narrow belts, fabric belts and leather belts. In Sword Belts you will find belts designed to help you carry your swords, daggers and arrows. We have single wrapped belts, double wrapped belts, and belt quivers.